Outdoor Research's wind resistant button-up with sun protection. I’ve been backpacking for years now, and have slowly started developing my ideal style. I’ve gotten my pack weight down to roughly 25 – 30 lbs (11.3 - 13.6 kg) before water, and am whittling it down every hike. Day hiking is nice, but getting out over multiple nights is really what I enjoy. I like to take my time and enjoy the scenery as opposed to hiking hard. I also like being comfortable and insist on an air mattress. I usually tent or hammock, but stay in shelters when needed. 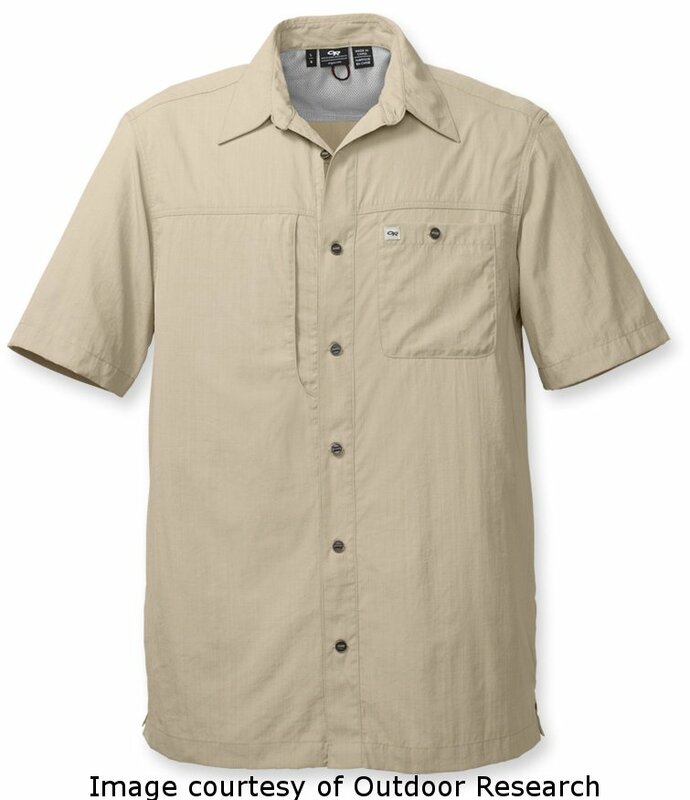 The Outdoor Research SoDo Short Sleeve shirt is designed with the fashionable hiker in mind. Touted as the perfect shirt to take on trips when space is limited, it's wind-resistance and sun protection help keep you cool and protected from the summer rays while still providing the classy look that transitions easily to a night on the town. The fabric is breathable and allows heat and humidity to escape easily. It is designed from lightweight nylon that provides a UPF factor of 30+. There is a relaxed fit straight hem along with both a zipper and button pocket on the front. 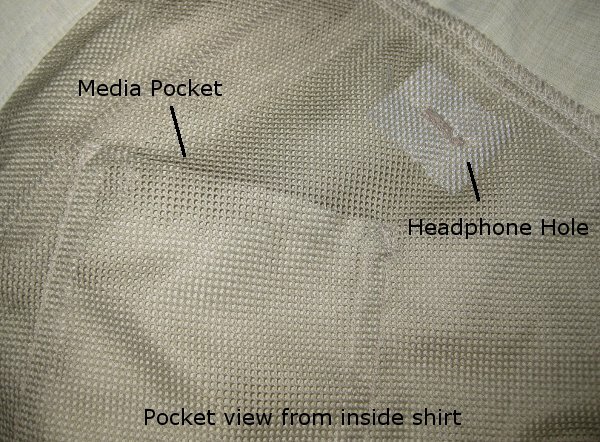 A media pouch is included in the zipper pocket along with a port sewn inside the shirt to allow headphone cords to pass through. The outdoor Research SoDo shirt arrived to my door intact, in good shape, and without any visible defects. As soon as I removed this shirt from its protective plastic bag I noticed how classy this shirt looked. I've always been one who likes wearing an over shirt. Even in the middle of summer I still like having something on over my t-shirt for various reasons. It was easily apparent from the beginning that the design and construction of the SoDo shirt was going to make this test both fun and comfortable. After removing the shirt from its packaging and trying it on, it was clear that there were a number of features to this shirt that needed to be addressed. One of those features that I noticed immediately was the construction of the buttons. Unlike traditional buttons that are sewn on with thread, these buttons were designed to have a piece of ribbon running through them. This allows the buttons to stand off the shirt a bit thus making it easier to slip them through their corresponding button hole without the chance of the threads that hold the buttons becoming weak. In my opinion, this is a wonderful feature as I'm always snagging a button on my pack straps and having it rip off at the most inopportune times. On the right hand chest is a zippered Napoleon style pocket. 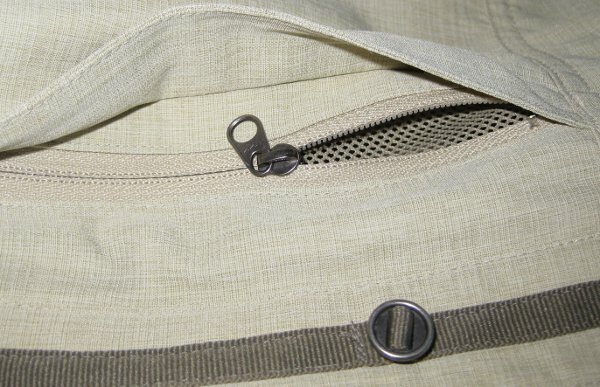 There is a flap of fabric that covers the zipper so that it's hidden from view. The zipper is plastic with fine teeth and slides easily even when put in a bind. The pocket is sewn in a peculiar way; the pocket itself is complete without the exterior wall of the shirt itself. The interior of the pocket is a soft mesh material. The exterior of the pocket is the same material that the shirt is made from. It is attached to the seams of the shirt at the shoulder, along the button side hem, and at the top. This allows the pocket to float inside the shirt. Also inside this pocket is a media player sleeve. While this will hold my iPhone 3GS without case, it will not hold my phone when in its OtterBox case. This isn't too much of a problem for me though as I usually stow my phone in my pants pocket anyway. The pocket on the left side of the shirt is a traditional chest pocket. There is no mesh and the pocket is entirely composed of the same material as the shirt itself. The interior side of the pocket is actually the shirt while the exterior of the pocket is an extra piece of material sewn to the shirt. The one thing that stands out is the ribbon button design as seen on the front of the shirt. Also on this pocket is a small OR logo sewn to the top hem. Along the top of the neckline, there is another piece of mesh material sewn into the shirt. It appears to keep the shirt off the neck itself allowing for a cooling effect from the increased airflow. However, on the right hand side of the sewn area is a small opening into the mesh area. It creates a sort of pouch. I wasn't aware of why this would be sewn in this way so I contact Outdoor Research for answers. After examining the SoDo on their end it was determined that the design was due to an OR logo on the back of the shirt. Had the mesh been sewn to the back of the shirt it would have been sewn right through the logo. At the bottom of the shirt on each side, where the front and back material come together, is a slit that is reinforced by the same ribbon that is used for the buttons. This helps to strengthen this area and prevent accidental tearing. On one of the side seams is a tag that includes washing instructions and an additional button just in case one is lost. However, due to the button design, it appears as if I will have to remove the entire ribbon to replace the missing button. 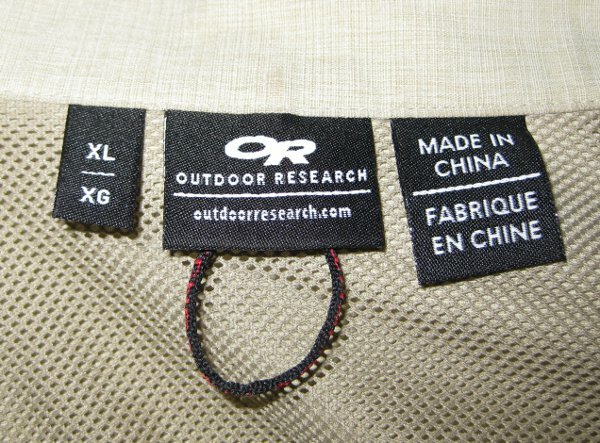 At the neckline of the shirt is the usual Outdoor Research sewn tag, a sizing tag, a Made in China tag, and a loop that is used for hanging. Also screen printed inside the button hole side near the bottom hem is the text "Designed by Adventure". In all the quality and construction of this shirt is very good. It is sewn nice and tight in all areas, appears to have quality materials, and looks quite good. I'm very pleased with this shirt as it met all expectations that I had when viewing the shirt on the website. In the past few days I've been able to wear the shirt for roughly 30 minutes and have already found that I am exceptionally comfortable in it. I look forward to a long and useful testing phase. I've been wearing the Outdoor Research SoDo S/S shirt about 15 - 20 times during the Field Report testing phase. It has quickly become one of my go-to shirts when I need something a bit more than a t-shirt. I've worn it during rainy days, as well as sunny conditions. It's been worn in heat up to 115 F (46 C) and cold conditions down in the mid 30's F (2 C). I also used it as an over shirt on a recent trip to Rocky Mountain National Park. Conditions on trail varied greatly with temperatures ranging between a cold 35 F (2 C) to a rather warm 75 F (24 C). During most of the trip the conditions were dry, but there was a bit of sprinkling rain during dinner time. Weather changed quite rapidly on the mountain as well dropping 20 F (11 C) in just over 30 minutes right around lunch time. Altitude for the trip ranged from 7,900 ft (2400 m) to 11,000 ft (3350 m) with quite a few steep sections and rocky switchbacks. The SoDo shirt has been quite a joy to test. From day one it has fit me like a champ. The material is soft and smooth, and just feels good on my skin. When I'm wearing it I feel no chafing or rubbing at all. In addition, the construction seems to be spot-on as I have yet to find any hanging threads or unraveling seams despite many trips through the washer. I've come to appreciate the well-cut fit of the Outdoor Research SoDo S/S shirt. The neck line is nice and tight without a lot of extra material that just ends up rubbing the side of my neck raw. The collar naturally lays down even during the strongest of winds that I've experienced while wearing the shirt. Even the top button at the neck line fastens quite well and doesn't cause my neck to feel like I'm being choked. The tags that are sewn in don't rub or scratch as the tags in other shirts do. The shoulders, and their seams, don't hang halfway down my upper arm like with most XL shirts that I've worn. Even the seams across the top of the back and chest have enough material that I don't feel confined. This is a great comfort indeed. The buttons all continue to remain usable and in place. This is something that I expected when I looked at the ribbon design during the Initial Report phase. However, I feel it is definitely worth mentioning as this shirt has seen maybe 15 trips through the washer and still hasn't lost a button. I have resorted to sewing a button back on, or at least reinforcing it, with other shirts that have made that many trips to the laundry. The zippered pocket still remains in good working condition, though I must admit I don't use it as much as the buttoned pocket. Also, the mesh material inside the shrift continues to be intact with no pulled or scraped mesh areas. The shirt has yet to retain any stains or marks of any type despite being quite dirty on multiple occasions. A few that I remember clearly were; the charcoal stains around the bottom of the shirt during a grilling mishap, having my 2 y/o son kicking his muddy feet on my side while packing him in from the rain, and a grease spot on the sleeve that happened while fixing a part on my Jeep. I've been yelled at many times by my wife for permanently staining new clothing, I even got a bunch of paint on a new set of REI shorts less than a week after they arrived. I was sure expecting the hammer to fall when I threw the shirt in the laundry a couple of times, but with a bit of pre-treating and some detergent all of the stains came out with ease. So far, I'm pleased with quality, construction, and wear of the Outdoor Research SoDo S/S shirt. I wear it a lot due to the comfort and fit that it provides. There are still no scrapes or blemishes on the material anywhere, and it has become a great dress shirt due to this fact. In the final weeks of this testing phase I was able to get an additional three days of trail use with the Outdoor Research SoDo S/S Shirt. These trips were long dayhikes in the Pennyrile State Forrest, a 14,000 a (5600 ha) section of forest that has roughly 23 mi (37 km) of trails. The elevation for the area is between 400 -700 ft (122 - 213 m). The temperature ranged from 65 - 73 F (18 - 23 C). In addition to these three trips I wore the shirt quite frequently around town, shopping, and just in general for daily wear. Conditions that I wore this shirt in ranged from 40's - 90's (4 - 32 C). There were plenty of days of rain as well as quite a few sunny, hot, and humid days as well. The Outdoor Research SoDo S/S Shirt has continued to be one of the first shirts I grab when I need an over shirt. It's a wonderful piece of clothing that allows me to layer up in any sort of conditions. Everything from hot steamy days, to cold crisp nights, this shirt has me covered and looking good. I've worn this shirt to the grocery store, hiking & backpacking, and even to church on a number of occasions. It simply is one of the most comfortable and best fitting shirts I've ever owned. In addition to the fit, the comfort that I've experiences while wearing a pack is second to none. The fabric is nice & smooth and allows the pack to move naturally across my shoulders without causing any friction. Even with extended use, I still have not noticed an residual smells on the shirt, nor have I found any permanent stains. As mentioned in my last report, all stains and goop that I've gotten on this shirt were easily removed by nothing more than a bit of pre-treating for a few minutes then throwing the shirt into the laundry with the rest of my wash. I performed no special care throughout the entire testing phase. All seams and the fabric itself remains intact. None of the seams have pulled loose at any time throughout the life of the test. While the shirt has been worn through some rather sticky brush, the shirt doesn't have any pulled threads, nor is there any noticeable pilling or chafed material. The buttons and the ribbon that attaches them are still in wonderful shape. There is no sign of the ribbon or the buttons pulling away from the shirt. Even the button holes are still in good shape which is somewhat hard for me to believe as I routinely wear my shirt with only the bottom one or two buttons securely fastened. In all, the Outdoor Research SoDo S/S Shirt has met all my expectations, has earned a coveted spot near the front of my closet, and is easily one of the first shirts that I grab whenever I'm heading out. No matter the circumstances, the SoDo fits and looks good. It is definitely one item I'll recommend to my friends who backpack as well. I'd like to thank Outdoor Research and BackpackGearTest.org for allowing me to participate in testing the SoDo S/S Shirt.